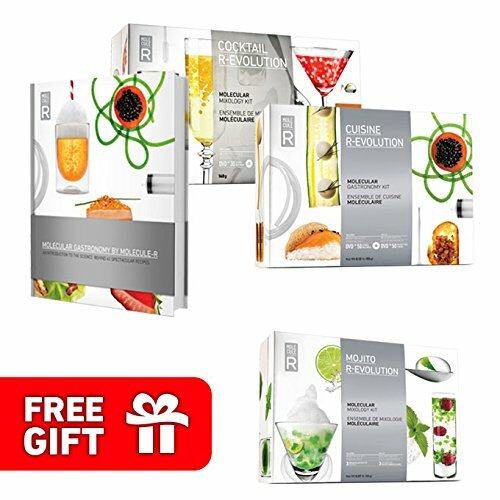 Our best offer to date for anyone looking to get started with both molecular gastronomy and molecular mixology, this new promotional package combines the scientific with the practical with our two most popular DIY kits so far-Cuisine R-EVOLUTION and Cocktail R-EVOLUTION-and our very first cookbook, Molecular Gastronomy by MOLECULE-R. Plus, it comes with a free mixology kit, Mojito R-EVOLUTION-perfect as an extra gift...or to keep for yourself! The kits each include natural food additives in pre-measured sachets, a toolbox packed with specialized utensils and plenty of recipes. As for the cookbook, it is the perfect combination of food science, illustrated tips and tricks and spectacular new recipes (40 of them!). If you have any questions about this product by Molecule-R, contact us by completing and submitting the form below. If you are looking for a specif part number, please include it with your message. Toasted Drinkware Squeezable Plastic Clear 2 oz Jello Shot Glasses with Lids (100 Sets) Shaped Like Actual Shot Glasses!